Although often overlooked the gearbox and back axle need to be lubricated with the right grade of oil and must always be kept filled to the correct level. If you allow the gearbox oil level to fall in an overdrive gearbox, the overdrive will not engage correctly and may switch in and out of it's own accord. Gearbox and back axle oil levels need to be checked at least every 6,000 miles, and the oil itself should be drained and renewed after 24,000 miles or every two years. MGB, MGC and chrome bumper Midget gearboxes require a good quality classic specification oil such as Castrol XL 20w/50, whereas the 1500 MG Midget and MGB V8 require Castrol EP 90 or equivalent in their gearboxes. All post 1950 MGs require EP 90 oil for the rear axle, with the exception of the MGB V8 which uses EPX 80/90. The oil in the gearbox and back axle operates under considerable pressure and serves a vital function protecting expensive gear components from wear, it is sensible to always ensure that the correct specification of oil is used. 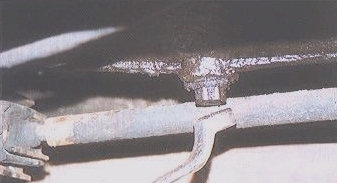 To improve access to the underside of the car, the front wheels were driven up onto service ramps and then securely blocked. The car was then jacked up at the rear and put on purpose built axle stands. 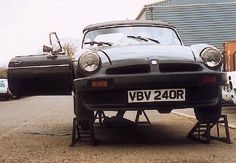 It is not strictly necessary to jack up both ends of the car together in this way, but on this rubber bumper model MGB the improved access to the gearbox was very helpful. In order to do this successfully you will need to gain access to the underside of the vehicle and this will entail crawling around under the car. To be able to reach the underside in safety you will need to raise the height of the car using service ramps or a trolley jack and axle stands, or even a combination of both. Draining the gearbox and differential is a straight forward operation, provided you have the correct spanner for the gearbox drain and refill plugs and the correct square drive key for the axle plugs. Note: All capacities listed in Imperial (UK) pints. Google "4.5 pints in litres" for an easy unit conversion calculator. N.B. If your back axle has been fitted with a limited slip differential you will need to use Hypoy LS. Always check your handbook for the correct specification and quantities of oil required for the gearbox and back axle. 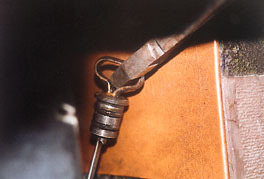 Early model MGBs and Midgets have a rubber grommet in the top of the transmission tunnel which allows access to combined gearbox dipstick and filler plug. This rubber grommet is concealed beneath the carpet just behind the console in the MGB. Later models such as the rubber bumper MGB have the refill plug on the side of the gearbox casing. The best way to refill this type of gearbox is to use a squeezy type filler bottle. Gear oils are often supplied in such a bottle, therefore it is best to change the oil in the back axle first, then you can re-use the bottle by filling it with a suitable XL 20w/50 oil to pump into the gearbox. Changing gearbox and axle oil is relatively simple and will do much to ensure the long life of these vital transmission components. 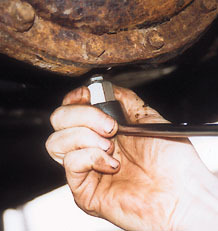 1) Undo the drain plug at the bottom of the axle casing using a square drive socket. 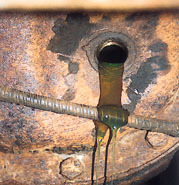 2) Drain the old back axle oil into a suitable waste oil container. Once the axle casing has completely drained replace the plug. and fill the back axle with the recommended oil. 4) The axle is filled to the correct level when the oil reaches the filler neck. 5) Undoing the gearbox drain plug, located just in front of the gearbox mounting cross-member. 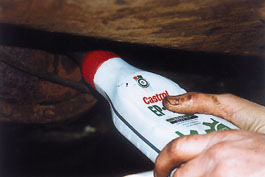 6) Carefully remove the drain plug by hand and drain the old gearbox oil into a suitable waste oil vessel. This one was made from an old plastic oil container with a hole cut out of the side. 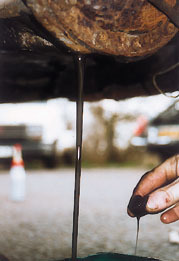 7) Allow sufficient time for the oil to drain completely from the gearbox. Once you are satisfied that all the oil has run out, then refit the drain plug. to remove this dipstick, it sometimes helps if you have a length of cord looped through the dipstick handle. Alternatively you can usually pull it out with a pair of pliers. 9) Using a funnel connected to about five inches of garden hose you can make an effective refill system. 10) On later model MGBs the filler plug is situated on the side of the gearbox. This is best filled with a squeezy type bottle. You can re-use an old EP 90 bottle by refilling it with 20w/50 oil for the gearbox. Now the gearbox is filled with oil and you can replace the plug. Comments on "MGOC Basic Service 2 - Gearbox and Axle Lubrication"
Question: Do you mean imperial pints? What is the conversion factor to U.S. quarts or liters. This would be a good time to clean the o/d filter.